Monday afternoon, everything the San Francisco 49ers feared (and in their heart of hearts, already knew) was confirmed. After undergoing an MRI, quarterback Jimmy Garoppolo was diagnosed with a torn ACL he suffered during Sunday’s loss to the Chiefs. Garoppolo will miss the rest of the season, which was supposed to be his first full season as a starter. During a 13-yard run in the 4th quarter of Sunday’s game, Garoppolo chose to pursue extra yards rather than get out of bounds. He ended up planting awkwardly and taking a hit from Steven Nelson. Eventually, Garoppolo had to be carted off the field. 49ers head coach Kyle Shanahan immediately feared a season-ending ACL tear, which was confirmed on Monday. Garoppolo will undergo surgery within the next week or two. His recovery is expected to take at least nine months. As Shanahan mentioned, the 49ers also lost starting running back Jerick McKinnon to a season-ending injury right before the start of the regular season. Obviously, without the starting quarterback and running back the 49ers planned on having prior to the season, they’re at a significant disadvantage. With Garoppolo out, C.J. Beathard will step in as San Francisco’s starting quarterback. Second-year player Nick Mullens will be promoted from the practice squad to the team’s backup. However, the 49ers will work out several other veterans in search of quarterback help. Shanahan mentioned T.J. Yates, Matt Moore, and Tom Savage specifically. However, Beathard will be the starter for the time being. Beathard threw what looked like a touchdown pass after replacing Garoppolo on Sunday, only for the play to be called back for offensive pass interference. He played in seven games last season, with the 49ers going 1-6 in those games. He completed 55% of his passes with four touchdowns and six interceptions, as well as three fumbles. He averaged just over 200 yards passing in those games with a QBR of 32.6. Prior to the injury to Garoppolo, the 49ers looked like a borderline playoff team at best. They were unlikely to win the NFC West with the Rams off to such a great start. Getting to a wild-card spot would have also proved difficult after both wild-card teams last season had at least 10 wins. With Beathard taking over at quarterback, San Francisco’s chances shrink immensely. 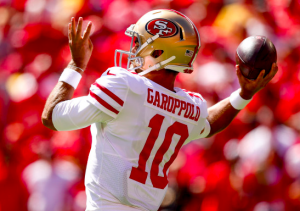 Just a few months after signing him to a five-year, $137.5 million deal, the 49ers may have to wait a little longer for the Garoppolo era to truly begin.